This bicycle loop of more than 20 km accross Paris region starts at Vert Galant station in Villepinte. It runs through the bike path along the Ourcq Canal, passes via Parc de la Poudrerie, Parc Lefebvre and crosses through Bondy forest. Points of interests : Parc Lefebvre and Bondy Forest. From Vert Galant station, go under the train tracks and cross the footbridge over the Ourcq canal. You will arrive at the bike path in direction of Paris. Go into the forest park Porte du Vert Galant and follow the cycle track until you reach Porte de Sevran (1,5km). Turn right to get out of the park and follow the canal on the bike path. 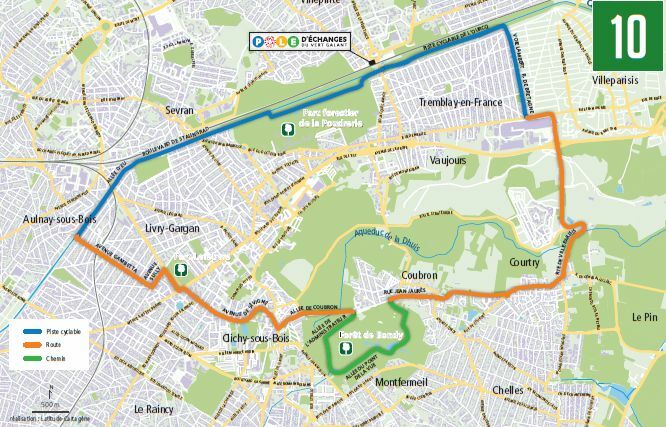 After 5 kilometers, leave the bike track on your left, at avenue de Livry Aulnay-sous-Bois, (it is located between a pink house and a small green fountain). Go straight on, avenue Gambetta then turn left onto avenue Sully until Parc Lefebvre. You will be able to enjoy the park and castle. After your visit of the Parc, take avenue Jean Jaurès (N370) right of avenue Sully. At the traffic lights, turn left and first right in direction of bondy forest regional park. Continue straight on for a little less than 2 km on the N370 then turn right in direction of Coubron –Bondy Regional Forest on the D136. Follow the Park for 1 kilometer until the main entrance at the traffic lights and enjoy the landscaped alleys in the forest ! To go back, take the D136 once more in direction of Coubron then the D86 in direction of Courtry. At Courtry, turn left onto rue de la Bergerie in direction of Villeparisis – Vaujours. Cycle up the steep road and continue straight on the D84. At the end turn left onto the D105 then take the second on your right (opposite Placoplâtre). Take the bike route (Voie Lambert) which runs along rue de Bretagne until canal de l’Ourcq. Follow the path along the canal (on the left side) until gare du Vert Galant station. The more experienced cyclists can do the expert bike route from Vert Gallant train station in Villepinte or (if they are crazy enough) try the Avenue Verte that links London to Paris all while visiting the best cultural places.